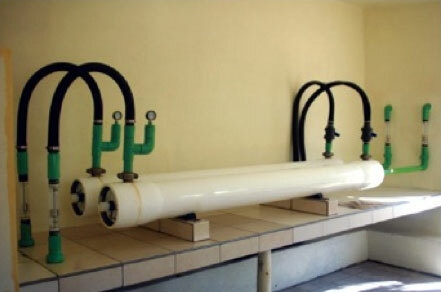 Photovoltaic Seawater Reverse Osmosis (SWPVRO) system using axial piston pumps and motors (APP/APM) as a high pressure pump and Energy Recovery Device (ERD). 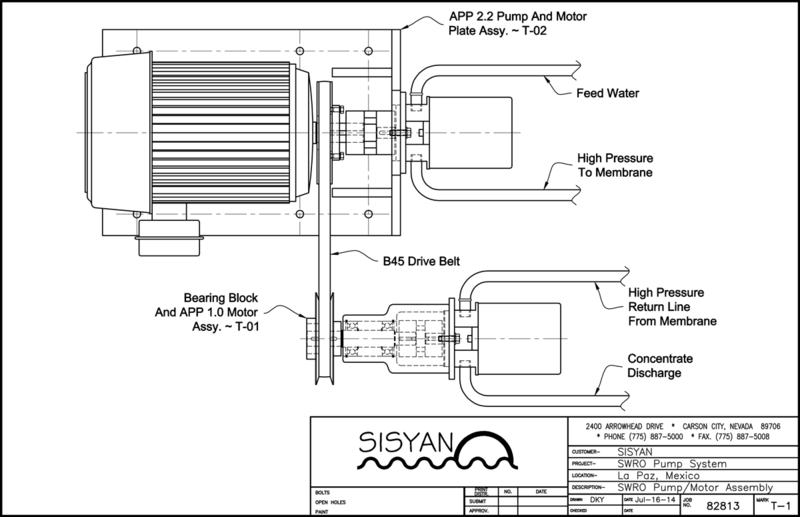 The torque generated by high pressure brine fed to the APM is added directly to the torque of the APP electric motor. The torques are combined by means of an adjustable ratio V-belt transmission. 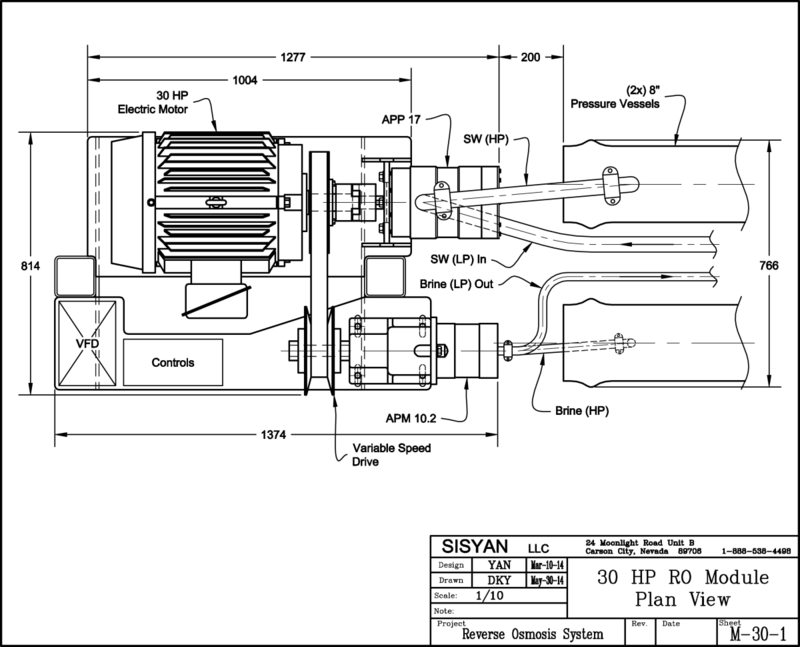 This arrangement enables the optimization of the yield of the system. The most cost-effective yield for the Mexia installations is 33 percent. 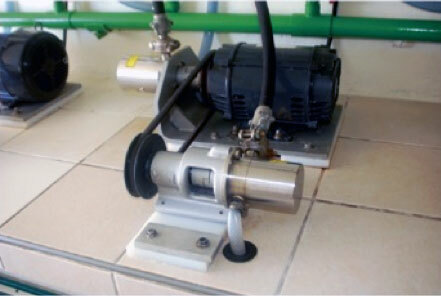 The pilot system consists of three 3hp modules. Each module is a fully integrated unit. 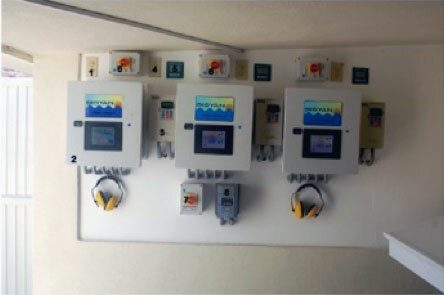 The modules share a seawater beach well, sourcing pump, ultrafiltration, permeate collection and management, brine disposal, permeate storage, PV array, and battery bank. Each module contains one Danfoss APP 2.2, one Danfoss APM 1.0, one 3hp 3-phase electric motor, an adjustable ratio V-belt transmission, a variable frequency drive (VFD), electric controls, two 4” pressure vessels housing six 4” x 40” seawater membrane elements, an assortment of titanium fittings and adapters, HP synthetic rubber hoses, gauges, sensors and Victaulic couplings. The operating voltage varies from 295 VDC to 354 VDC. The array of PV panels has a capacity of 18kWp and is connected directly to the battery bank. The voltage of the battery bank changes with the applied charging current and the load current. The charging current changes with the solar irradiance, and the load current with the number of modules in operation. The electrical control switches ON/OFF the VFD of the modules, monitoring only the battery bank voltage. The starting and stopping voltage for each module is preset at different values. The VFDs are connected to the DC battery bank. No battery chargers are used. 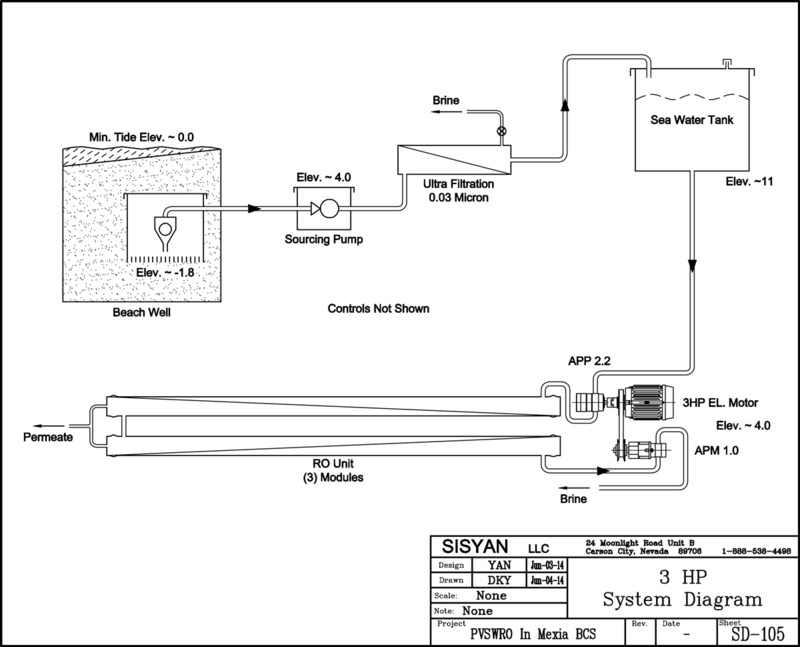 The system produces permeate with TDS lower than 300. The seawater salinity is 33,000 TDS. Initially we used media filters and 5 micron cartage filters. In 2007 those were replaced by 0.03 micron membrane elements. 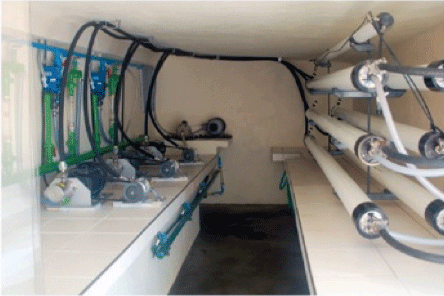 Adding ultrafiltration resulted in almost doubling the service life of the APP/APMs and membrane elements. The average annual production is 6500 m3 (1.7 M gallons). The seawater flow is 21.5 liters per minute (5.7 GPM) per module. The average seawater pressure is 680 psi.